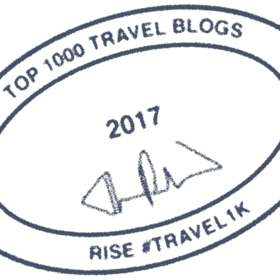 The 2017 #travel1k Top 1000 Travel Blogger badge shows a passion for travel and helping people all over the world achieve their travel dreams and aspirations. The badge is earned by individuals (sometimes working in teams of 2 to 4 people) who share their travel tips and stories on a blog and social media. You need to be listed on the #travel1k leaderboard (www.rise.global/travel1k) on at least one weekly release during 2017. This leaderboard ranks the travel bloggers by scoring them on their social media influence using their Klout score (50%) and their twitter conversations containing "travel" (50%). Tweets containing "travel" are given a point, retweets by others of such a tweet are given 3 points and mentions in a tweet with "travel" earns 2 points.